Thea is a slave girl from Judaea, passionate, musical, and guarded. Purchased as a toy for the spiteful heiress Lepida Pollia, Thea will become her mistress's rival for the love of Arius the Barbarian, Rome's newest and most savage gladiator. His love brings Thea the first happiness of her life - that is quickly ended when a jealous Lepida tears them apart. 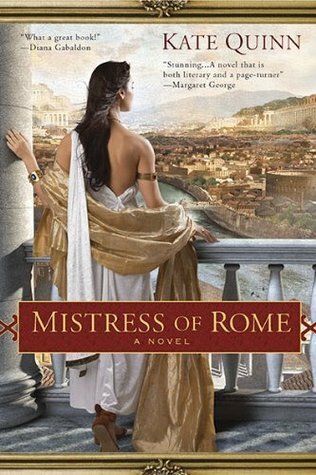 It has been awhile since I've read a historical fiction novel and even longer since I fell completely into a book, such as I did with Mistress of Rome. The cover and title make this book sound like a light, fluffy book filled and focused on a romance, but the truth is that it is so, so much more than that. Throughout the book we follow multiple perspectives, which I felt gave a very rounded story. Quinn did a fantastic job of keeping the perspectives separated in a way that there was no confusion and it became very easy to fall into the story and know what is going on between characters and their own stories. I really enjoyed seeing all the different characters change and grow throughout the story. I was surprised to find that the story spans years throughout the characters lives, but that made the story seem real and the characters develop in a natural way. I thoroughly enjoyed Kate Quinn's writing and story-telling. Her writing was fanastic; just the right amount of description to make the setting seem real without going overboard and adding too much descriptions to the story. The vividness of the setting and characters brought the story to life for me. There were some hard parts to read - the brutality in the arena that gladiators were put through, the harsh and terrible treatment of slaves, and the horrific treatment of some of the women by men in this book was hard to read, but I appreciated the way that Quinn handled it delicately and the way that she gave enough details to understand the seriousness of the situation without giving all the gory details. I'll admit when I read the synopsis, I didn't know what could take up nearly 500 pages when the story sounded so simple. However, there is so much that happens and so many twists and turns that I couldn't stop reading. There is so much complexity that there's always something happening, but I want to emphasis that there isn't too much that I couldn't keep track or didn't remember something. It was just the right amount. I absolutely loved this book. I couldn't stop thinking about it when I wasn't reading it. I didn't want to put it down. I immediately wanted more when I finished it. If you like historical fiction, or if you like stories with fantastically developed characters and a story with twists and turns, then this is the book for you. I do want to warn about some triggers. This book is very hard to read at times. There is brutality in many forms throughout the book. Brutality within the arena of gladiator fights. Abuse, both physical and mental, between men and women. Adultery. Sexual Assault. A romance that begins between a 14/15 year old girl and a 25 year old man (I understand that this was normal for the times that this is set, but to some that may not matter).